Steam Trading: Out of Beta and available to everyone! Discussion in 'Team Fortress 2 Talk' started by tf2.com, Sep 6, 2011. At any rate, as of today Steam Trading is officially out of beta, in the Steamworks SDK, and available to everyone. Two new games will now have tradable in-game items: Spiral Knights, the cooperative adventure from Three Rings and Sega, and our own Portal 2. And remember, this is just the beginning. We can't wait to see what our fellow gamers and developers are going to come up with to move Steam Trading forward. 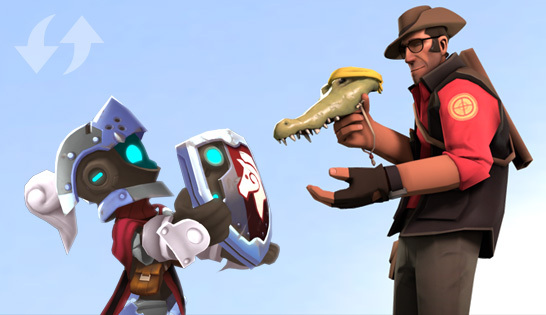 To celebrate, items are on sale in the Team Fortress 2, Portal 2, and Spiral Knights in-game stores. I'd really like to see another community update by Valve.